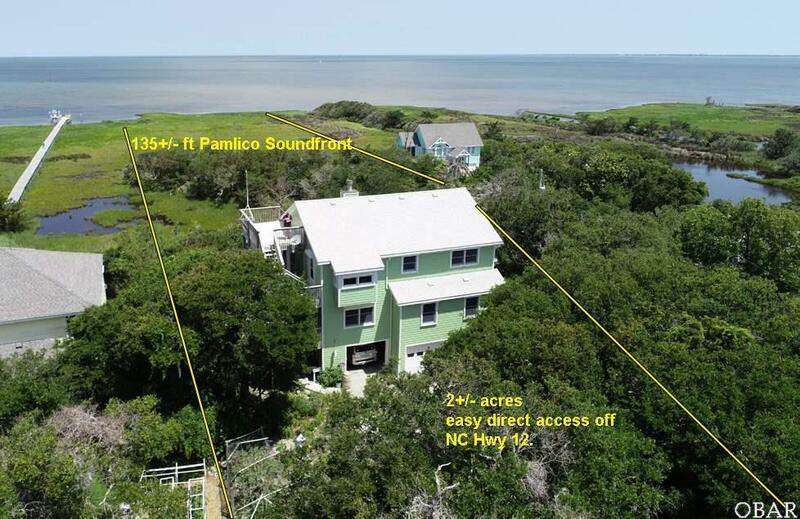 SOUNDFRONT "SAFE HAVEN" HAS A COMMANDING VIEW OF THE PAMLICO SOUND. THIS 2+/- ACRE PARCEL IS LOCATED ON ONE OF BUXTON'S TALLEST WATERFRONT RIDGES. STRUCTURE IN X FLOOR ZONE. NO FLOOD INSURANCE REQUIRED FOR MORTGAGE. VERY PRIVATE COMPOUND FOR A FISHERMAN AND HIS ARTIST WIFE. LANDSCAPING INCLUDES BLUEBERRY BUSHES AND ONE OF A KIND ARTWORK. 2X6 STURDY CONSTRUCTION AND AN INCREDIBLE THOUGHTFUL FLOORPLAN. NO EXPENSE SPARED. DRY ENTRY THROUGH XXL TWO CAR FINISHED GARAGE WITH REINFORCED AUTOMATIC DOORS AND LIFT (DUMBWAITER) TO ALL FLOORS TWO SEPARATE BUT EQUAL HEATED SPACES ARE ON TAP FOR BUYERS. ONE AN ART STUDIO AND THE OTHER A WORKSHOP. GARAGE HAS BEEN SET UP TO HOLD THE SELLER'S TACKLE SHOP SIZED COLLECTION OF GEAR. WHOLE HOUSE AUTOMATIC 14KW PROPANE GENERATOR. ON THE SECOND FLOOR UP THERE ARE THREE BEDROOMS AND TWO FULL BATHS. 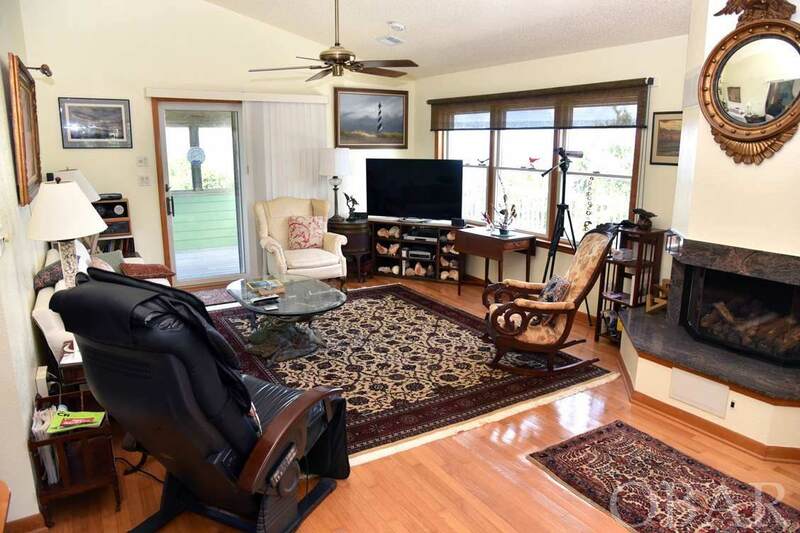 HARDWOOD, CARPET, AND TILE FLOORS ABOUND. ONE IS A LARGE MASTER WITH LARGE BATH WITH WHIRLPOOL TUB AND SEPARATE SHOWER. XL LAUNDRY ROOM. 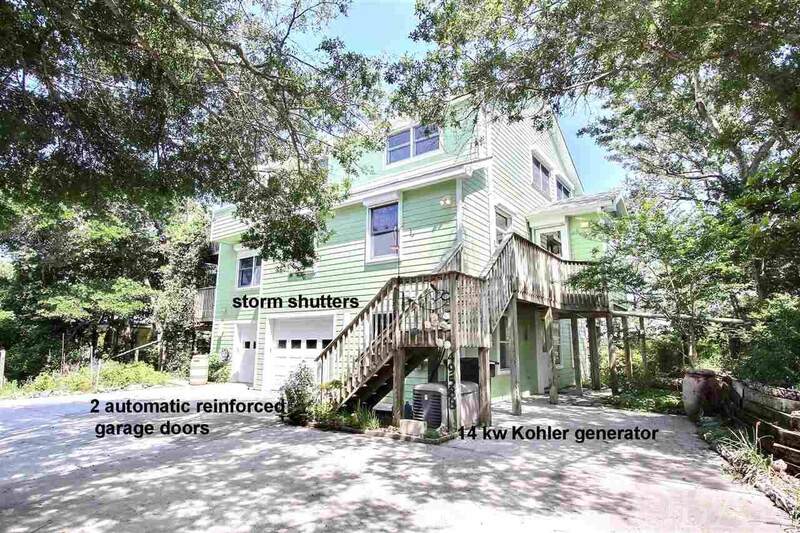 SELLERS HAVE STORM ROLL DOWN SHUTTERS AND PANEL SHUTTERS THROUGHOUT. FRONT NORTH WINDOWS HAVE ADDITIONAL ANDERSON STORM WINDOWS. TOP FLOOR LIVING AREA HAS ALL WOOD AND TILE FLOORING. XXL ALL EQUIPPED KITCHEN WITH COPIOUS AMOUNTS OF CUSTOM "POSSUM BUILT" CABINETS. MASTER BEDROOM ALSO HAS "POSSUM" BUILT STORAGE. BATHROOMS HAVE CUSTOM CABINETS. LARGE FULL HALL BATH NEXT TO BEDROOM 4 WHICH OWNERS USE AS AN OFFICE/DEN. SEPTIC FOR 4 BEDROOMS. THE XL GREAT ROOM IS SPLIT FROM EAST TO WEST AS DINING, PUZZLE TABLE SPACE (ELECTIVE), AND LIVING. SUPER CUSTOM PROPANE "RUEGG" (Swedish) FIREPLACE ANCHORS THIS AREA. COMMERCIAL SIZED GUTTERS DIRECT MUCH RAINWATER TO STORAGE BARRELS FOR PLANTS AND GARDEN. THE XL ORIGINAL SCREENED PORCH IS CURRENTLY LACKING SCREENS. SCREENED PORCH AND STAIRS LEAD TO TOP FLOOR OBSERVATION DECK. WATER AND WETLAND VIEWS FOR MILES. THIS HOUSE WOULD BE WELL SUITED FOR A PATH TO NEAR SOUND AND THEN BOAT PIER WITH LIFT (LIKE NEIGHBOR TO WEST) COULD ALL BE PERMITTED. SAFE HAVEN SHOULD BE YOUR KIND OF PLACE. MAYBE IT SHOULD JUST BE YOUR PLACE. NO DETAIL NO MATTER HOW SMALL HAS BEEN OVERLOOKED. CALL NOW. 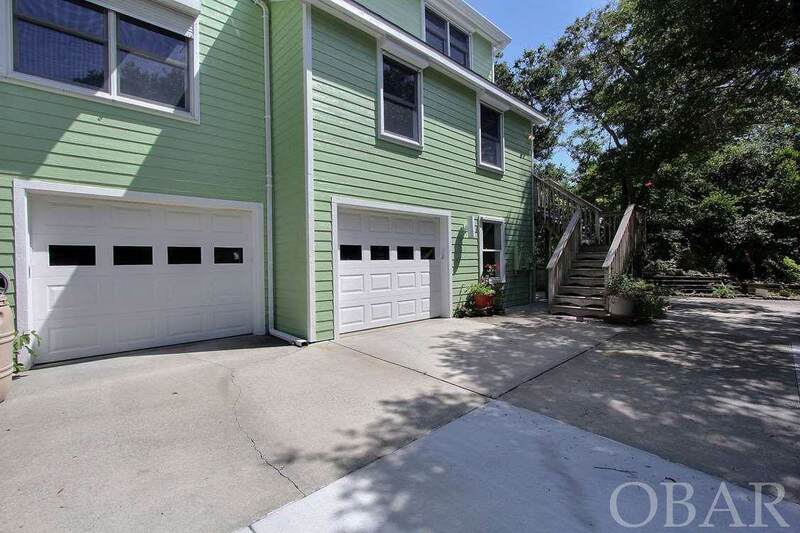 "THIS PROPERTY IS AT THE TOP OF THE BEST DESIGNED AND EQUIPPED HOMES FOR THE HATTERAS LIFESTYLE." TWO OF THE BEST REASONS TO LIVE AT "SAFE HAVEN......WERE NAMED FLORENCE AND MICHAEL.